Religion • Research suggests change in deployment could spur more baptisms. 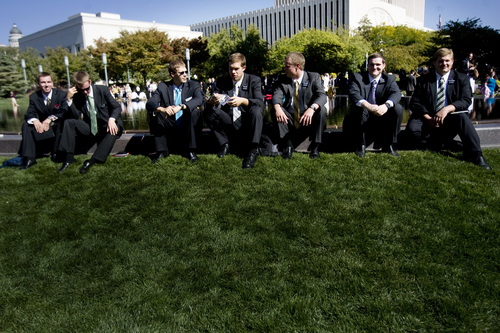 Kim Raff | The Salt Lake Tribune A group of LDS missionaries site by the reflecting pool at Temple Square during the 183rd General Conference of the LDS Church in Salt Lake City, Utah on October 7, 2012. Leah Hogsten | The Salt Lake Tribune Elder Samuel Heinzen and fellow missionaries were the last entrant of the parade. Thousands flocked to downtown Salt Lake City this morning for the Days of 47 Parade, a commemoration of the day Brigham Young and many LDS pioneers first reached the Salt Lake Valley. Chris Detrick | The Salt Lake Tribune Mormon missionaries work at preparing meals at the Missionary Training Center in Provo Thursday November 28, 2013. 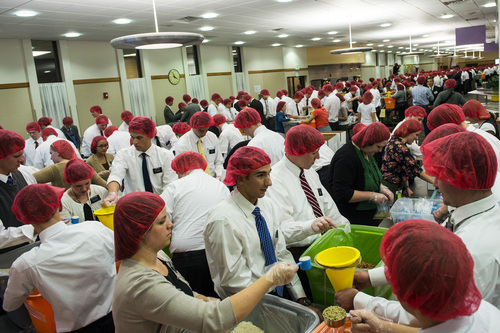 The 1,800 missionaries spent Thanksgiving by preparing 350,000 meals for hungry Utah children. The packages of nutritious, nonperishable food will be provided to Utah schools where they are sent home with children in need. Courtesy LDS Church LDS missionaries in Africa Kim Raff | The Salt Lake Tribune LDS missionaries Elders Tyler McCord, left, and Devin Duke sit by the reflecting pool at Temple Square during the 183rd General Conference of the LDS Church in Salt Lake City, Utah, on Oct. 7, 2012. The day before, church President Thomas S. Monson had announced lower age limits for Mormon missionaries -- 18 (down from 19) for men and 19 (down from 21) for women. 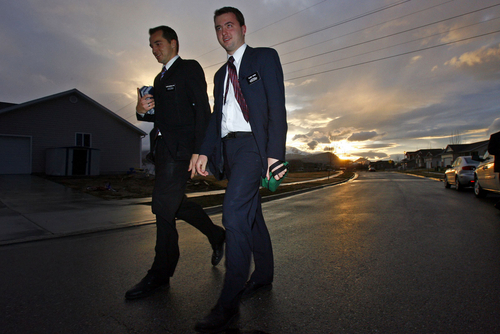 The Destination America show "Hidden in America: The Mormons" includes a look at LDS missionaries. Trent Nelson | The Salt Lake Tribune Missionaries at the Missionary Training Center of the Church of Jesus Christ of Latter-day Saints in Provo Tuesday June 18, 2013. Chris Detrick | The Salt Lake Tribune Mormon missionaries work at preparing meals at the Missionary Training Center in Provo Thursday November 28, 2013. 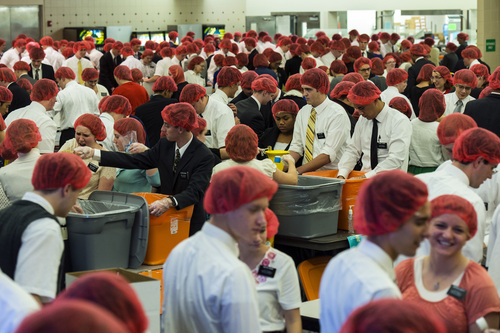 The 1,800 missionaries spent Thanksgiving by preparing 350,000 meals for hungry Utah children. The packages of nutritious, nonperishable food will be provided to Utah schools where they are sent home with children in need. 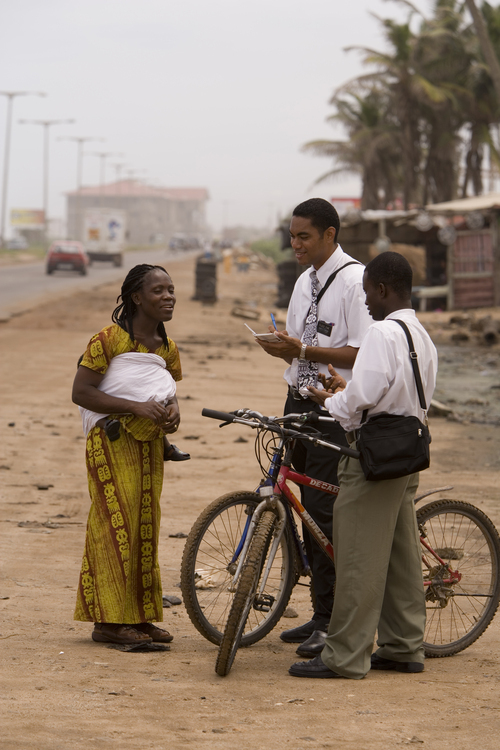 Courtesy LDS Church LDS missionaries in Ghana Sariah DeVard, right, and Alexandra Santa Maria work to bring the message of the LDS Church to the West Valley city area in this 2006 photo. Photo by Danny Chan La 3-27-3006 Elder Ryan Mourelatos, left, and Elder Ryan Wood work to bring the message of the LDS Church to the West Valley city area. 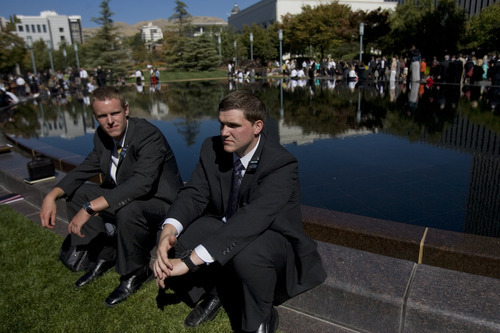 Kim Raff | The Salt Lake Tribune LSD missionaries (left) Elder Tyler McCord and Elder Devin Duke sit by the reflecting pool at Temple Square during the 183rd General Conference of the LDS Church in Salt Lake City, Utah on October 7, 2012. Trent Nelson | The Salt Lake Tribune Sister missionaries at the LDS Missionary Training Center in Provo Tuesday June 18, 2013. 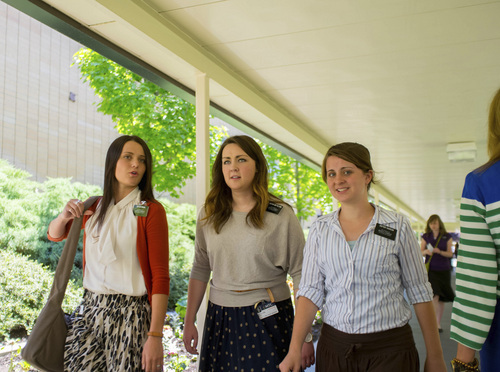 Since the Utah-based faith lowered the age for women from 21 to 19, it has experienced a dramatic increase in the number of female missionaries. Previous, fewer than 20 percent of those training at the MTC were women, now it is up to 42 percent. 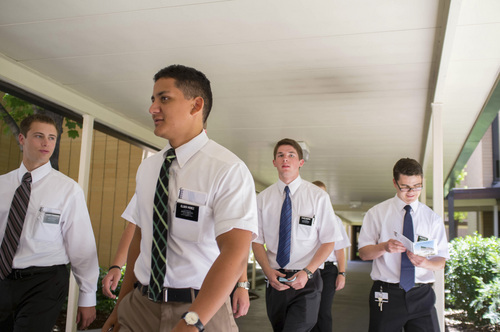 In the year and a half since the LDS Church lowered the minimum age for full-time missionary service, the Utah-based faith has seen its proselytizing force swell from 58,500 to more than 83,000. That&apos;s a 42 percent leap. The number of convert baptisms last year grew to 282,945, up from 272,330 in 2012. That&apos;s an increase of  less than 4 percent. How can that be? Why would a surge of 25,000 additional eager and earnest suit- and dress-wearing, scripture-packing, pamphlet-peddling young "elders" and "sisters" not translate into a similarly dramatic jump in the number of Mormons on membership rolls? 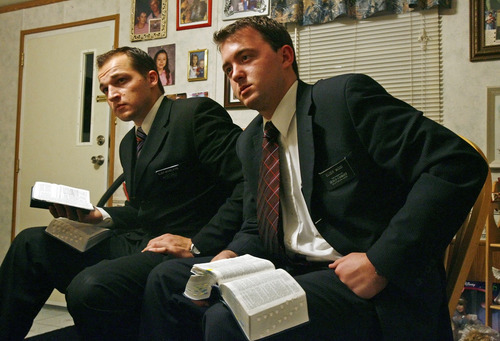 The main problem, says independent researcher Matt Martinich, who closely watches LDS growth patterns and statistics, is that the new missionaries were largely assigned to areas such as the United States and Latin America, where Mormons are well-established and the "market" for the religion may be saturated. "Most of the surplus in missionary manpower was allocated to less-productive areas, where the church has more developed infrastructure that could accommodate such a sudden, massive increase in missionaries serving," says Martinich, who lives in Colorado Springs. "In U.S. missions outside of the Intermountain West, every congregation had a companionship [pair of missionaries]. It was hard to keep even one busy. Now they have two or three [pairs]." It is understandable why The Church of Jesus Christ of Latter-day Saints placed the new missionaries in these areas, he says. Opening new countries or regions can be difficult and time-consuming, especially in terms of getting visas, guaranteeing safety, overcoming health concerns and assessing political stability. The LDS Church eventually added 58 missions (there are now 405 around the world) after the missionary ages fell to 18, down from 19, for young men, and to 19, down from 21, for young women. But most of those nations had already seen a Mormon missionary presence of some kind. Playing it safe, Martinich maintains, is "counterproductive in terms of baptizing new members." 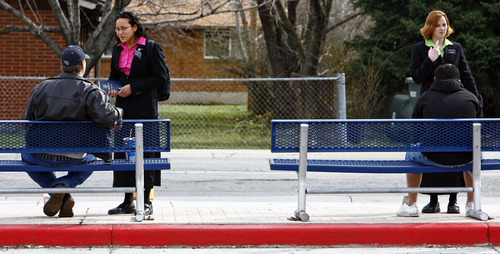 The Mormon missionary system is built on a "centers of strength" strategy. It starts in a population center, usually a big city, with a single congregation, staffed by the standard all-volunteer clergy and then grows as new members are added until it becomes large enough  usually at about 200 members  to be split in two. It can take years to create a stable and thriving Mormon presence, explains Martinich, who co-wrote the encyclopedic "Reaching the Nations: International Church Growth Almanac: 2014." The policy almost ensures slow growth  but growth nonetheless. Unlike many denominations, the 15 million-member LDS Church is still adding throngs of members (and faster than most). David Stewart, a Las Vegas physician and Martinich&apos;s co-author on the two-volume atlas, points to general societal trends as contributing to the slumping ranks in many religions and the moderating growth rates in Mormonism. "More and more U.S. students arriving at college age identify themselves as agnostics or atheists than ever before, and church attendance across many faiths in the West has been stagnant or declining for some time now," Stewart writes in an email. "People are more skeptical in the Internet age and convert baptisms are more difficult to come by. We are seeing similar religious trends in the U.S. to what was going on in Europe 30 or 40 years ago." In fact, the LDS Church tallied 281,312 convert baptisms in 2011 with help from 55,410 full-time missionaries. That&apos;s barely 1,600 more converts than last year, when there were nearly 28,000 more missionaries. 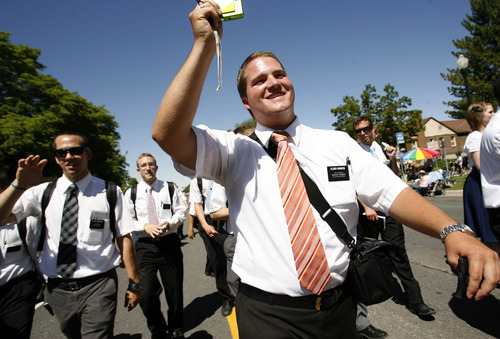 As it stands, the ratio of converts to Mormon missionaries has slipped from 5-to-1 in 2010 to less than 3.5-to-1 last year. LDS officials note "many factors contribute to church growth." "While more missionaries generally result in more converts," says church spokeswoman Jessica Moody, "in 2013, the number of missionaries increased steadily throughout the year and drawing conclusions between missionaries and baptisms based on year-end figures is problematic." Stewart and Martinich say the number of members helping missionaries find potential converts has not kept pace with the influx of new proselytizers. "That is the key ingredient," Martinich says, "to improving the efficiency and productivity of missionary work." The two researchers were at a conference recently in Los Angeles, where an LDS mission president has instructed his missionaries not to "tract" (go door to door) or contact potential converts on their own, but to rely exclusively on member "referrals." Missionary-minded members also are seen as vital players in helping converts stick in their newfound faith. LDS leaders have conceded that retention remains a problem and have invested considerable resources in trying to remedy it. Even so, Stewart says, "if missionaries are not engaged in independent finding efforts but are reduced to being little more than &apos;cheerleaders for members,&apos; ... large increases in the missionary complement are unlikely to appreciably increase convert baptisms." LDS leaders have been experimenting with new missionary approaches. In several U.S. cities, including San Jose, Denver and Dallas, these young men and women now spend at least two hours a day involved in humanitarian service, rather than the traditional "tracting." Their efforts tend to build good will with the community and may, in the long run, translate to more converts. In parts of Africa, LDS officials have begun to break with the "centers of strength" policy by creating "member groups," made up of a single member or a missionary companionship, meeting somewhat informally before there are enough members for a "branch." These groups typically turn into branches, which are smaller congregations than LDS wards, more quickly than traditional models, Martinich says. 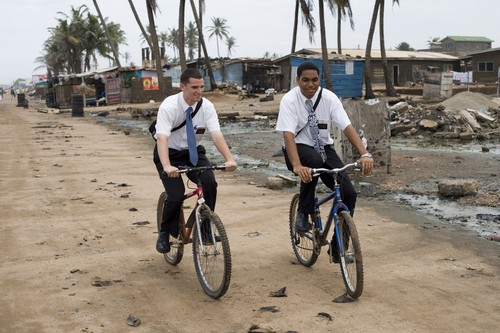 Ultimately, though, the goal of Mormon missionary work may be as much about converting the proselytizer as converting the proselyte. "A mission is seen as a pivotal experience," Stewart says, "in solidifying commitment to the church among missionaries themselves." And it works. Stewart says there is a strong correlation between missionary service and ongoing church activity, compared to young Mormons who do not serve missions. So the most important number of conversions per proselytizer may be one: the person the missionary sees in the mirror every day.